A rescue mission leads Jay and Lila Cooper to a doomed South Sea island where nothing is as they expected. Instead of a primitive civilization, the Coopers encounter a busy colony with a mysterious leader claiming to be Adam MacKenzie, a missionary once presumed dead. To add to the confusion, someone seems to have pushed the island’s self-destruct button. Earthquakes and erosion are tearing the island apart, and every moment is precious in the Coopers’ search for the real Adam MacKenzie. 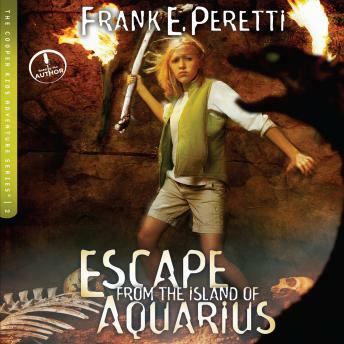 Escape from the Island of Aquarius is a tale of action, stolen identity, and nail-biting cliffhangers. You will not be able to put it down. Don’t miss the other exciting audio books in The Cooper Kids Adventure Series® — The Door in the Dragon’s Throat, The Tombs of Anak, and Trapped at the Bottom of the Sea.